At the Gator 100’s inaugural event this month, Dr. James M. Kiely, a graduate of University of Florida’s College of Liberal Arts & Sciences (CLAS), accepted University recognition for his partnership in AcuteCare Telemedicine (ACT), the leading practice-based provider of Telemedicine services for stroke and emergency neurological care. Founded in 2009, ACT allows hospitals to access highly-respected expert Neurologists and Telemedicine technologies twenty four hours a day through the application of the latest telecommunication technology. 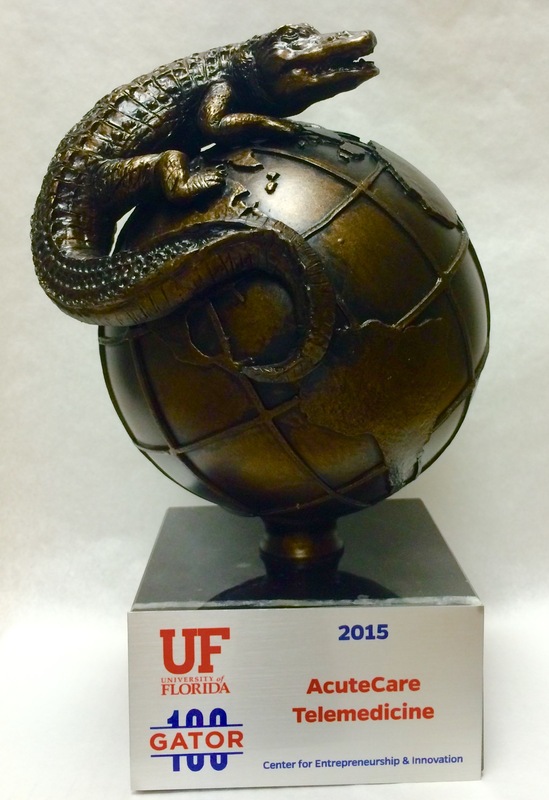 ACT ranked as the 16th fastest growing Gator-led business. Dr. Kiely is a partner in Atlanta Neurology, P.C. and Medical Director of the Neurophysiology Departments at Northside Hospital and St. Joseph’s Hospital of Atlanta. He is a member of the Epilepsy Foundation of Georgia and a past Chair of their Professional Advisory Board. After graduating with Honors from the University of Florida, he received a M.D. from Emory University and earned a Ph.D. from the Emory Department of Pharmacology for a thesis on nervous system control of blood pressure. He completed a Neurology residency at the University of Virginia, with fellowship training in Epilepsy and Intensive Monitoring. During this tenure, he was the recipient of national awards for epilepsy research. Dr. Kiely is Board-certified in Neurology with added qualifications in Clinical Neurophysiology. He was recently named one of America’s Top Doctors by US News and World Report. Congratulations to AcuteCare Telemedicine on being selected to the 2015 Gator 100! Things are heating up in state and federal legislatures when it comes to advancing legislation that will help accelerate the spread of telehealth across America. The American Telemedicine Association (ATA) is working with congressional representatives to move forward on what is known as, “21st Century Cures”. The ATA is recommending that Congress take immediate action to improve coverage for telehealth services under Medicare payment innovations in a number of areas from fee-for-services to Accountable Care Organizations to bundled payment programs. The House and Energy Commerce Committee recently released a draft bill that will, in part, direct the Centers for Medicare and Medicaid Services (CMS) to implement a methodology for coverage of telehealth services. Outside of Washington and all across the country, State legislatures are making telemedicine a priority issue for 2015. Ten states; Arizona, Arkansas, Connecticut, Montana, New Hampshire, New Mexico, Oklahoma, Virginia, West Virginia and Wyoming have introduced legislation that will impact how their state licensing boards enforce established clinical practice standards. In Arkansas, Connecticut, Indiana, New Jersey, Rhode Island, and Washington law makers are considering legislation that will require telehealth parity under private insurance. In the state of Florida the battle to find acceptable legislative action to help increase access to health care in their rural communities is on-going. A bipartisan group of House and Senate leaders are confident they will reach agreement this year on how to boost the use of telemedicine in their state. “It’s abundantly important that we get it done and get it done right,” House Health Care Appropriations Chairman Matt Hudson, R-Naples, said during a news conference at the state Capitol in Tallahassee. As with several other states, law makers continue to struggle to pass legislation that satisfies legislators’ and healthcare industry concerns for the safety of patients and maintain the fiduciary responsibility of state government. Lawmakers during the past few years have filed telemedicine bills that would allow for the use of modern telecommunication technology in the delivery of healthcare but the Florida House and Senate have not been able to reach an agreement. This year legislative leaders are expressing confidence that they can resolve their differences on regulatory issues. One of the points of disagreement in Florida and other states is the issue of individual state licensing and whether out-of-state physicians should be allowed to provide telemedical care to patients in their state. The current requirement and process of requiring a physician to be licensed in each state where treatment is rendered continues to be a significant stumbling block to the unabridged expansion of the practice of telehealth across state boundaries. If the year 2015 is to become the predicted tipping point for expanding the benefits of technology driven medical care, state legislatures in Florida, and other states around the country, will need to do more than just debate and negotiate over the future of regulations that were relevant to times past. It is even a busier time than usual for medical professionals who are focused and dedicated to fighting cardiovascular diseases and stroke. The American Heart Association (AHA) will be sponsoring The International Stroke Conference, “Connecting the World to Stroke Science,” on February 11-15 at the Music City Center in Downtown Nashville. It is the world’s largest meeting of medical professionals dedicated to the science and treatment of cerebrovascular disease and will attract more than 4,000 cerebrovascular experts from around the world including neurological specialist from AcuteCare Telemedicine (ACT). The leading practice-based provider of telemedicine services for hospitals seeking around-the-clock stroke and other urgent neurological care will be an exhibitor at this premier AHA event. On March 25, 2015 the Georgia Partnership for Telehealth will be conducting their 6th Annual Spring Conference in Savannah, GA. The conference is a great opportunity for Primary Care Providers, specialty physicians, advanced practice nurse practitioners, Physician Assistants, Registered Nurses and medical facilities administrators to learn how the most up-to-date telecommunications technologies are impacting the delivery of stroke care and other healthcare services. Attendees will experience telemedicine in an applied framework, build network relationships and gain exposure to the latest in telehealth hardware and software technology. The conference will include a Grant Writing Workshop and will feature presentations from foremost experts in teleneurology.